A score in the style of MR. POPPER’S PENGUINS presents somewhat of an ambiguous challenge for a reviewer. On the one hand, one’s internal feelings towards it can be summed up in with remarkable ease, yet putting those feelings into words proves more of a task. ROLFE KENT’S music is just there. It does very little to stand out in any way, positively or negatively, merely acting as a simple backdrop, rather than something to be truly remembered. Of course, this can be said for many a comedy score. Very few offer cues that threaten to linger in the memory once the credits roll, exceptions being a small handful of DAVID NEWMAN scores perhaps. A run–of-the-mill such as this clearly doesn’t require a forceful score, or one that almost becomes an individual character in itself, but once a score is released certain expectations arise, often to never be met. KENT’S score is all very pleasant, joyful and will lift the spirit of a listener at least momentarily. 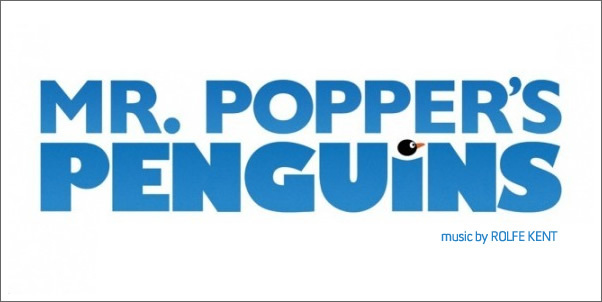 Beyond this MR. POPPER’S PENGUINS offers little and eventually becomes a chore in its unending enthusiasm. The themes present lack the substance for any inspired variations and therefore tend to meld together.